Makes designer's hearts beat faster: The digital personal scale Linea made of deep-black, surface finished safety glass and framed in brushed stainless steel is in a class of its own. 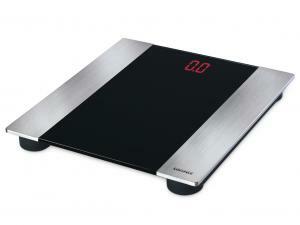 The effective red LED screen lights up as soon as you step on the scale, and shuts down automatically after use. The large platform provides great stability for up to 150 kg with graduation to 100 g precise. A jewel that may as well be displayed as wall art.